An extensive collection of chord progressions for pop and rock. Organized in full song structures (intro, verse, pre-chorus, chorus and bridge). A section solely devoted to ballad playing styles. Covering straight or swing in 4/4 and 6/8. Played by professional session pianist. 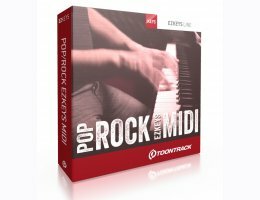 After completed installation, the Pop Rock EZkeys MIDI will be accessible directly from the EZkeys interface and allow for the same smart transpose and drag and drop functionality as the stock EZkeys MIDI.